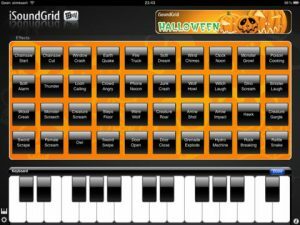 iSoundGrid Halloween for iPad App Review: Spooktacular Fun! 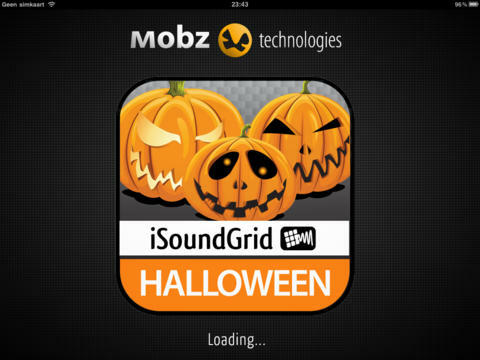 iSoundGrid Halloween for iPad is an iPad app developed byWebbForce Mobz. With Halloween right around the corner, this inexpensive app is a must-buy for fans of the spooky, the kooky, and the funny. 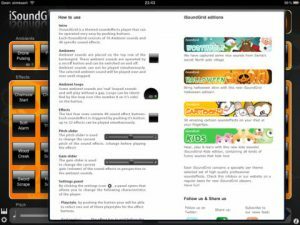 If you want to set the mood for Halloween parties, prank calls, haunted houses, trick or treating, or general ambience, this sound board app is superior to a lot of similar apps that are already out there. One thing that I really love about this app is the fact that you can overlay sounds, and play multiple sound effects at the same time. You can layer 32 sounds simultaneously, which is really cool! There’s also a ton of sounds to choose from, and that variety makes this app tons of fun to noodle around with. There are 10 ambient sounds, as well as 50 specific effects. These include screams, growls, explosions, thunder, fire, and “creepy” dripping noises. The interface is simple enough for kids to use without supervision, but there’s enough content here to keep adults amused as well. There is a sound logic to how this app is laid out, and it is easy to find what you’re looking for. Another feature that I really like about iSoundGrid Halloween for iPad is the autoplay timer mode. This is perfect for people who want to have the app going in the background, and have it turn off automatically when a party or “trick or treat” hours are at an end. 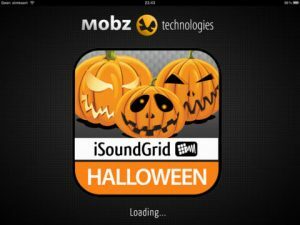 You should know that these developers have also released a FREE Lite version of iSoundGrid Halloween for the iPhone. The iPad version of the app has far more sounds, however, which makes it better IMHO. 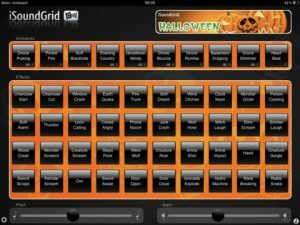 Overall, iSoundGrid Halloween for iPad is a sound investment for fans of Halloween, haunted houses, and spooky parties. Want to see this app in action? Check out this demo video! 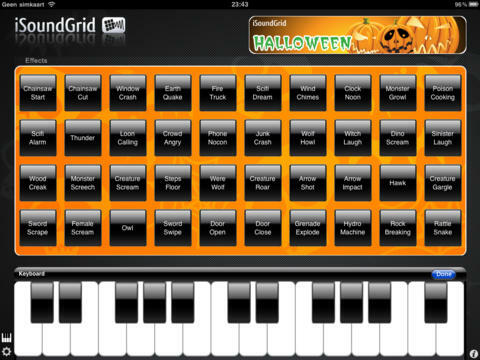 isoundGrid Halloween for iPadrequires iOS 5.0 or later. Compatible with iPad.